Earlier this summer, my father and I hit the Rainbow River, we’d been talking for months about kayaking, and finally decided one Saturday to go for it. Neither of us had been for years, so it was really nice to get out there on the water, listening to the birds, smelling the clear air, and just relaxing. We had been in pretty drought like conditions for a while, a few years now, summer is supposed to be our rainy season here in Central Florida, but it was terribly dry the last few years, so the river was easily about 18 inches lower than it normally was. Thankfully since our outing, we had our usual summer rains, and the river is topped out again, and looking even better! We ended up seeing a lot of wild life, even as we dodged the wild humans with their flotation devices that were floating downriver(we paddled upriver). There were turtles, an otter, eagle, osprey, fish, and a plethora of different birds. The bugs, oh the bugs! A huge variety of dragonflies, water bugs, and even butterflies, I would have given a lot to have my net with me…though I see it now, “I can reach…-Splash-…I’m Ok!” This tree was in the middle of the Rainbow, just about where the Rainbow River and Withlacoochee meet. 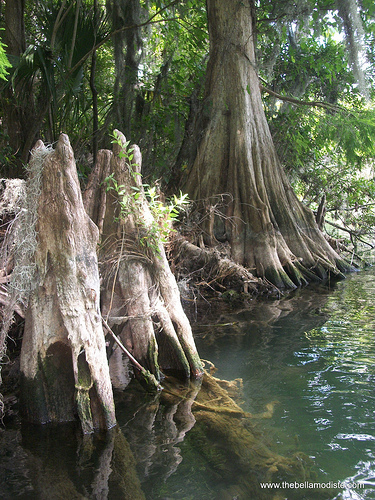 Beautiful old cypress like this, are all up and down both rivers. You can see the high water mark on it, where the water level should have been. This is a pretty well-known tree on the river, also near the Withlacoochee and Rainbow River junction, it is home to both Anhinga , and Cormorant nests(If I remember properly, I can’t find the article about it anymore). The water was beautiful, despite being low, and wonderfully cold, so perfect for a dip on the warm day. We made it into an inlet- which turned out to be the location of an old hard rock phosphate pit. A little off the beaten path, there were no other people in this spot, so there were birds a-plenty one of which(a Cormorant I believe), we were able to get right up close to, I was about 10 feet away, and was happy to snap a quick picture of it! It was late afternoon on our way back down river, and the light was hitting the trees just so, really making the bright leaves all aglow, a gorgeous sight to be sure. The tall cedars and other trees along the Rainbow River, really help to shade it, and if you are careful, and stick close to the banks(while avoiding wasp nests, and snakes in the trees), you can get off without a bad sunburn(especially if you forgot to grab the sunscreen on the way out the door…oops). Next post- our venture up the Withlacoochee River- from the same trip. I remember when Paul was just six months old. I was at Bass Galore for the summer to help Aunt Marilyn and Uncle Paul with the fishing lodge and cabins they owned. I loved the Rainbow river and the Withlacoochee river. Your pictures reflect all that I remember and the beauty that still exists there. I am glad you took that trip with your dad. Bonding time and memories made that can never be taken away from either of you. And pictures to keep those memories a look away for the both of you. Love you guys and miss you. wish I could have been there with you, but that was a time for dad and daughter. Yes, it was such a fantastic trip up the river- we really had a great time! I always love to see the river, and see all the wildlife. They offer boat rides on the river by the hour- from a restaurant on the Withlacoochee, you should take a look into that next time you are here- so worth the time to get to see everything! I’m eager to see the rest – and the the pictures from the next trip! Beautiful location for a getaway–such nice photos. Are you sure you don’t work for the state tourism dept?